Sweet tooth? 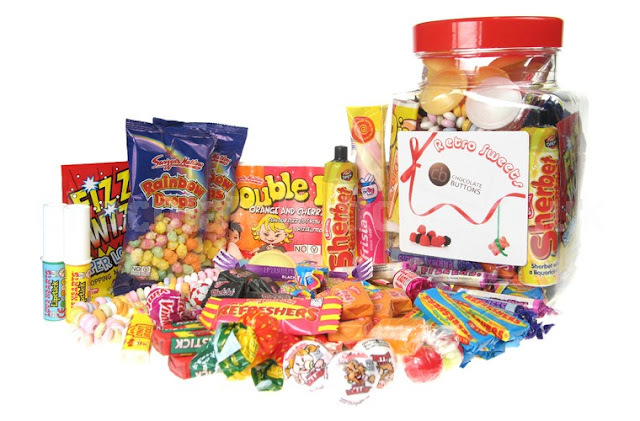 This delicious, and rather large, retro sweets jar should hit the spot perfectly, being packed with treats that will take you back to your childhood. Whether you want to scoff it all yourself, share it with your family and friends or give it as a gift you can add a personalised message to the front of the jar to make it extra special. We have a jar to giveaway from Chocolate Buttons, one of the biggest online confectionery retailers within the UK, that provides everything from bars and coins to novelty gifts and wedding favours. For your chance to win a Giant Retro Sweets Gift Jar you can enter via the Rafflecopter entry form below. Wow, fabulous prize! I love the Fizz Wizz (Strawberry Space Dust)....yummy!!!! I'm a big kid and love candy necklaces! Ahhhhh, love them all, wow! Um, favourite is probably the drumstick lolly - brings back so many summertime memories! Got to be the Sherbet Fountain for me! Sherbet Fountains - blast from the past!! Flying Saucers and drumsticks - takes me back about 30 years! 10p and 20p mix-ups every Saturday - many of the sweeties were only half penny each! Did Fizz Wizz used to be called Space Dust? Does anyone remember the large gob-stoppers called fireballs? The mega retro sweets box! We had a retro sweets tuck shop at my sons party and it went down a storm... especially with the adults! Space dust - can't beat it ! lovely prize and following by blog lovin and tweeted! SHERBET FOUNTAIN IS MY FAVOURITE. Toffee Crumble. I love that stuff. I love Black Jacks but I have to be careful not to upset my Dentist! My favourite has to be the fruit salad chews. My favourite is the Old English Fudge Chocolate. Parma Violets!! They taste purple! Flying Saucers are my faves! ooooh so many....have to be Mr Tabs followed a close second by fruit salads!! Commented on Silent Sunday too! Fizz whizz, have a secret supply of popping candy in the cupboard that is all mine, hidden away from the kids *blushes*! The Fizzers are my favourite from the jar! oh, just look at The Best Ever Liquorice MEGA BOX, that looks so good. ALL OF THEM!!!!!!!!!!!!!! although double dips are nom. my fav is rainbow drops. flying saucers win every time! I follow you on Networked Blogs, Bloglovin and GFC (GFC I appear as Izzie). Yummy! Retro gift jar giveaway! Chupa Chups Milky Lollipops on the chocolate buttons website Mmmmmmmm Yum. Especial the strawberries and cream! Anglo Bubbly! eee that takes me back. Mmm, my favourite is a fizzy parma violet - fabbityfab, could go one right now!